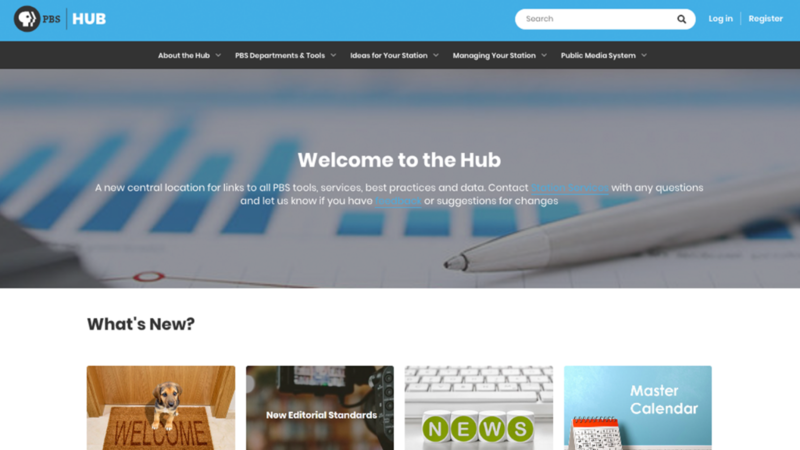 We are excited to introduce your one-stop shop for all public media related resources and information: the Hub! Formerly known as the Station Management Center, the Hub offers a new and fresh design but with all the same features you know and love from the SMC making it easier for you to find services based on your station’s needs. The Hub is centered on the idea of bringing together all the facets of your station to improve sustainability and build capacity for the long run. We often hear how difficult it is to find all resources available for PBS member stations so we made it easy by putting them all in one place. We know all the best work is already being done at local stations therefore we work to bubble those best practices and innovative ideas to the top and share with the rest of the PBS system. We strive to make the Hub a source of inspiration for your station to thrive in your community by providing you the latest media trends and customized data and analysis for your station. The Hub makes it easier to manage all of your PBS related newsletter subscriptions so you can make sure you’re getting the information directly related to your area/expertise. If you have any questions about the new site, please contact us at StationServices@pbs.org.